PRESIDIO, Texas —The area around the present town of Presidio on the Rio Grande, known as La Junta de los Ríos, is believed to be the oldest continuously cultivated farmland in Texas. About 1500 B.C. indigenous corn farmers settled here for access to water and the game and vegetation it supported. Presidio’s strategic location is as important in 2015 as it’s been for more than 3000 years, and it is a key to the town’s hope for economic expansion. Presidio is located where it is because of water. 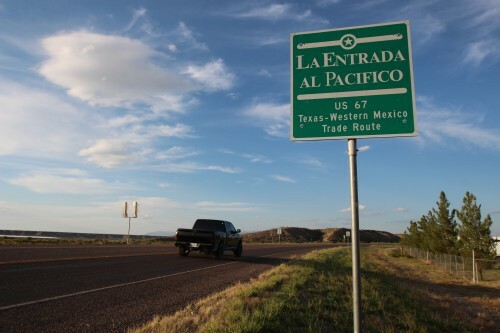 Both Presidio and its sister city of Ojinaga, Chihuahua were settled at a spot known as La Junta, the melding of Rio Conchos in Mexico flowing into the Rio Grande, known in Mexico as Rio Bravo del Norte. “Water’s not out here everywhere in this desert,” said Terry Bishop, the patriarch of a family with roots here stretching back generations. As the Rio Grande became stressed with the population explosion in the southwest, Presidio was blessed by its proximity to the Rio Conchos. It has always supplied what the Rio Grande increasingly cannot. That was in the mid-1960s. “Everybody knew everybody,” Bishop continued. Bishop says Presidio may have changed but that it always feels safe and comfortable. He can’t contemplate living elsewhere. Many peoples have passed through what is modern-day Presidio of thousands of years. Like many border towns, Presidio has a blended identity, American and Mexican. One institution in Presidio that celebrates both cultures, Panaderia Don Jose, Jose’s Bakery, is run by the fourth generation of the Hernandez family. The Hernandez family has two bakeries, one here in Presidio and the original in Ojinaga which dates to the 1950s. The family story isn’t isolated. They’re among many who came to the northern border of Mexico from the interior, in their case from Jalisco State on the Pacific. “We have been here for three generations,” a proud Miguel Hernandez, Don Jose’s son said in Spanish. Presidio has been a crossroads for centuries and played a role in the Mexican Revolution, allowing some fighters from the Battle of Ojinaga to seek refuge in the town. In that battle, revolutionary leader Pancho Villa routed Mexican federal troops and went on to spur the establishment of some of the basic constructs of modern Mexico like agrarian reform and compulsory education. But today Presidio finds itself in a stretch of desert where jobs are tight and the economy is challenged. U.S. Census figures show that the median household income here is less than half of the median incomes across Texas. Some people believe businesses that might otherwise exploit Presidio’s strategic location have avoided investing here because, as 25-year-old Jose Hernandez says, they may be influenced by what they hear in the media. “It’s just a stereotype, you can call it, ‘cause people from other places that don’t know come exactly how it is,” he said. Presidio Mayor John Ferguson went further. Some say the history of Presidio is nothing less than a tapestry of migration and movement. “It’s an extremely rich history,” said Andy Cloud, the leader of the Center for Big Bend Studies at Sul Ross State University in Alpine. “When you look at all the time frames beginning as early as AD 1200,” he continued. “It’s always been a center point. That is where these two rivers, these two rare rivers in the Chihuahuan Desert come together. And so it’s always going to be focal point. It was in the past and it will be in the future,” said Cloud. These days, the medium term economy looks at the very least promising. Much of the Mexican beef used in the U.S. fast-food industry enters the United States at Presidio. The city is looking ahead and is planning to help service oil and gas production that Mexico is planning for this part of the borderlands as part of Mexico’s recently-enacted energy reform. The reform allows foreign companies, like U.S. fracking and oilfield services companies, into Mexico for the first time since 1938. Presidio’s mayor meets regularly with Mexican and American politicians and energy executives in hopes his town will get a piece of what analysts suggests will be major energy development just across the river. This entry was posted in KRTS Music and tagged Border Economy, city of presidio, Ojinaga, Rio Grande. Bookmark the permalink.